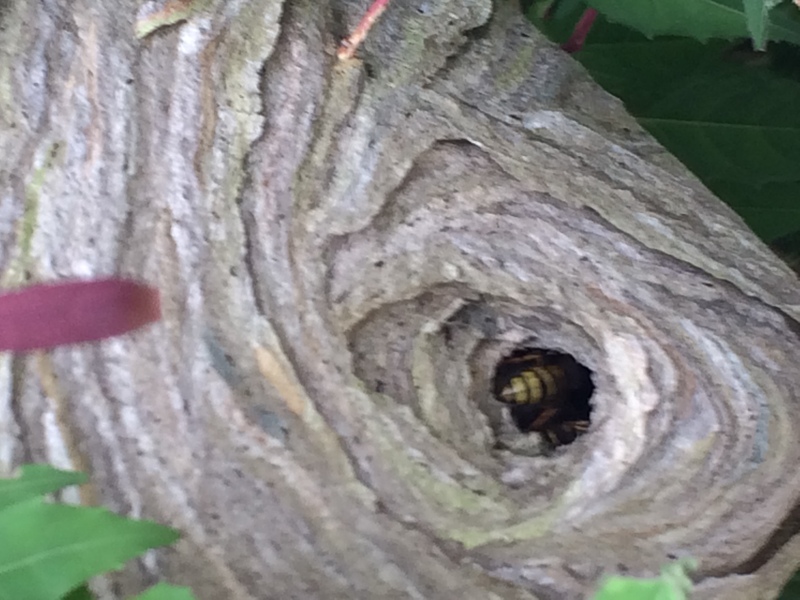 Spotted this wasp nest in a Fuschia bush whilst out walking on Mountain Rd. Dromintee this morning! Description:The adult birds usually have blue-grey head, breast and upperparts, and horizontal barring on the underparts and white spots and tips on the tail. Voice:The female has a rich bubbling chuckle, but the male’s call is the very familiar “cuckoo”. Generally, if you hear a Cuckoo singing you will probably not see it until it stops singing, and flies away. Feeding: Caterpillars and other insects such as beetles and ants form the major part of the Cuckoo’s diet. Many of the caterpillars are the hairy or brightly coloured poisonous ones, but their digestive system is specially adapted to cope with the hairs and toxins. The female will also sometimes eat the eggs and nestlings of the host bird. Nesting: The Cuckoo is a brood parasite, it lays its eggs in other birds’ nests and leaves the host birds to incubate and rear its young. Dunnocks, Robins and Meadow Pips are frequent host birds. Each female Cuckoo specialises in using a particular host species and will lay eggs with similar markings to the host bird’s eggs, and the young Cuckoo will imitate the begging calls of the host’s chicks. When the Cuckoo nestling hatches, it instinctively pushes the other eggs and nestlings out of the nest. Movements: They are a summer migrant, arriving around April and returning to central and southern Africa from mid-July to August. The juveniles follow in August and September. On our recent walks we have seen lots of this low growing, hairless perennial plant with its distinctive, bright yellow flowers and fleshy dark green, heart, shaped leaves. A member of the buttercup family, it is found throughout Europe and west Asia. It prefers bare, damp ground and is known as an early harbinger of Spring, apparently making an appearance each year on the 21st of February, more generally it flowers from early February through to May. 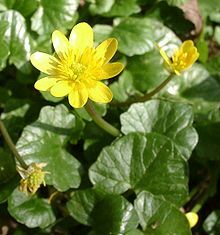 The word “Celandine” comes from Latin meaning “swallow” as it was said that the flowers bloomed when the swallows returned and faded when they left. The name “Ranunculus” is Latin for “little frog or tadpole, perhaps referring to its being found near water, or to the fact that the unopened flowers resemble tadpoles. The plant used to be known as Pilewort because it was used to treat haemorrhoids, as the knobbly tubers of the plant were thought to resemble piles! In German it is known as “Skorbutkraut”- scurvyherb because of the use of its leaves which are high in Vitamin C to prevent scurvy, but beware the plant contains protoanemonin a mild toxin and medicines made from the plant should be extracted either from the dried plant or through the use of heat. The flower is mentioned by a number of literary greats in their works: J. R. R. Tolkein, C. S. Lewis, D.H. Lawrence and most notably, William Wordsworth all make mention of it. Wordsworth was so inspired by the little flower, that he wrote three poems about it. On his death it was proposed that a lesser celandine would be engraved on his tombstone, but unfortunately a mistake was made and the greater celandine, a member of the poppy family was used instead. Last time out in the Cooley’s we saw evidence of frog life with sightings of both adults and frogspawn. Find below information about their life cycle, taken from the Irish Peatlands Conservation Council website. When the adults emerge from hibernation they migrate to congregate at various breeding sites. They may travel up to half a mile to find a site where they gather in large numbers. The males always arrive first and strike up a chorus of loud croaking to attract females. Frogs do not have any elegant courtship rituals; the eager male simply grabs the nearest female as she arrives at the spawning site. Jumping onto the female’s back, the male wraps his fore limbs around her body and grips using nuptial pads, on the fore limbs – a position called amplexus. Spawning itself can take place any time during amplexus and lasts only a few seconds. The female lays over 2,000 black eggs while the male releases sperm. The eggs are fertilised immediately and before their gelatinous capsules absorb water, swell and rise to the surface. After spawning the female usually leaves the pond, while the male often goes on to search for another mate. Both male and female frogs return to the same pond year after year, probably recognising it from the smell of the water and algae. Eggs & Frog Spawn: Each frog egg is 2-3mm in diameter and is enclosed in an envelope of jelly. When the egg is deposited in the water the jelly swells to a diameter of 8-10mm insulating the eggs from the water. The egg develops into a tadpole in 10-21 days (the higher the temperature the shorter the development time). Tadpole: The tadpole digests the spawn jelly using a special secretion and hatches. Specific adhesive organs fasten the newly hatched tadpole to other spawn or plants in the pool. At this early stage tadpoles have no mouth, and until its mouth organs form it feeds on an internal yolk sac attached to the stomach. At approximately 2 days old the external gills, mouth and eyes are formed. At this stage it moves like a fish and begins to eat algae. 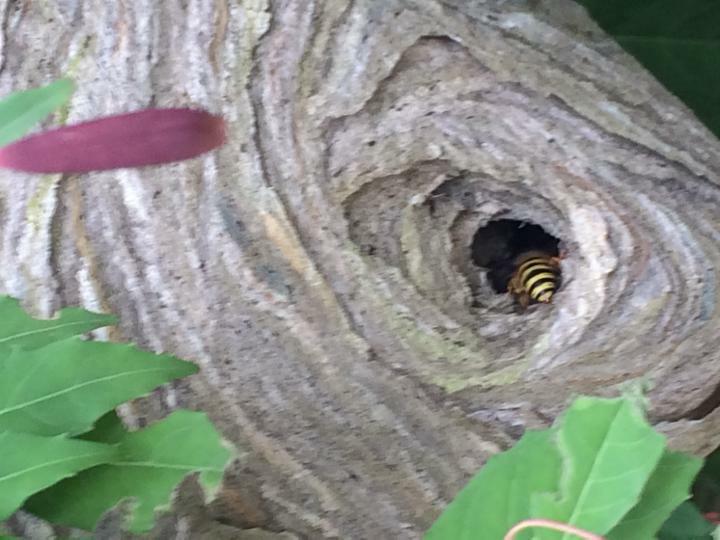 At 12 days spiracles and internal gills are formed. At 5 weeks the hind legs are showing and the lungs are forming. It then has to swim to the surface of the water to gulp air. The tadpole has fleshy lips with rows of teeth for rasping away at water plants and by seven weeks it also eats insects and even other tadpoles. Froglet: At 10 weeks the forelegs are growing. The hind legs are fully grown and the tail is reducing. At 14 weeks the tail is nearly fully absorbed. 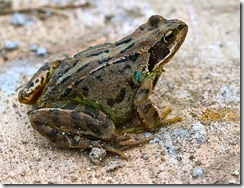 At this stage the froglets are usually starting to spend time on rocks or in nearby damp grass. Young frogs usually double in size by the following autumn and they reach sexual maturity in their third year. They can live for 7-8 years. Scarcity of food or severe cold may delay metamorphosis and overwintering tadpoles are not uncommon in northern countries. What exactly is the Gap of the North and why does it matter? There has always been some confusion about its exact location. Older people use the term to refer to the deep glen on the Ballynamadda Road from Dromintee, just south of the junction with the Tievecrom Road, but its proper name is Gleann Dubh. The historical term refers to the road between Faughart Shrine and Kilnasaggart Bridge. It has always been one of the most strategic assets in Ireland for the well-known reason that geography determines history. Here’s why. In southern England human remains have been found which are 135,000 years old and much older remains have been found elsewhere in Europe. We have nothing like that – the earliest signs of human presence here date just to 9,500 years ago. The reason is that before that the ice was a kilometer deep here. From 100,000 years ago until about 12,000 years ago Ireland was covered by a series of recurring glaciers which moved back and forth across the country grinding everything down to the bedrock and picking up billions of tonnes of rock and gravel and carrying it off to dump elsewhere in the next thaw. Then the ice slowly pulled back northwards but stopped on an east-west line roughly level with us. And then it thawed relatively quickly and dumped out all that rock and gravel in regular heaps. Those heaps are the drumlins, the litte rounded or elongated hills that you can see around Cullyhanna or Poyntzpass. The drumlins stretch across the country from Bangor all the way to Mayo. Even today it is difficult to build roads in Drumlin country, as you can see along the A1 from Newry to Loughbrickland. At least we can now cut through them – in past centuries they were too steep to go over and often too boggy in the dips to go around, particularly in the winter months. Through the last 9000 years the drumlins have been a barrier to communications between Ulster and the rest of the country. There are only two major breaks in the Drumlin belt – around the lakes of Fermanagh and the mountains of South Armagh. They provied the two major roads north, across the ford on the Erne at Ballyshannon and through the Gap of the North. In ancient times there were five roads leading from different parts of Ireland to the royal seat at Tara. Our road which started on the North Antrim coast was known as An Sli Miodhluachra. In the Middle Ages the pass was referred to by the Norman English as ‘Imermallane’ which must be an Irish word but the usual Irish term was ‘Bearna Uladh’. It was also known as ‘Bealach an Mhaighre’ (road of the salmon) which may be a shortening of some reference to the Three Mile Water. From that we derive Moyra which is spelt Moyry in many documents. The Normans arrived in Ireland in 1169 and took the country by storm with vastly superior weaponry and general military skills. The first force had just 200 mounted knights but they were the tanks of their day. More importantly they had 1000 archers who were the machine-gunners – a good archer could have three arrows in the air at the same time. They swept throug the Gap with great slaughter and took the north – but they never had the forces to hold it. Apart from outposts at Carrickfergus, Downpatrick/Lecale, Newry and Carlingford, Ulster remained firmly in Irish hands for another 350 years – until O’Neill pulled out of the pass and headed to defeat at Kinsale. The old road starts at Dowdalls Hill in Dundalk. There is a little road beside Nicholas Arthur’s shop called Doylesfort Road which leads out through the townlands of Annies and Whitemill and swings right at Faughart Shrine. It then goes into the Gap itself (which was heavily wooded until Mountjoy cut the trees down in 1601) and on to the Three Mile Water, the stream at Kilnasaggart Bridge which was probably wide and boggy and would have been crossed on a kesh (ceis), a causeway made of logs and branches. It followed the line of the Kilnasaggart Road to Baile an Chláir and on down to the Four Mile Water (the Flurry). In Carrickarnon beyond the turn for Edentubber the original road is still there to the left, but where it comes down to the border would have been quite a large bog then, and Elizabethan records refer to a ‘broken causie’ or causeway there, which must have been quite long and was probably more substantial than a kesh. The road is still there all the way to Newtown Cloghogue. From there, according to local belief it may have originally gone over the Bernish to Newry. The main ambush points against armies invading from the south were at the narrowest point of the Pass between Slievenabolea to the left (where there is a rockface called Éadan an Airm or hillbrow of the army, where O’Neill’s men may have mustered) and Claret Rock to the right; at the crossing of the Three Mile Water; and on the ‘broken causie’ at Carrickarnon. Such was the reputation of the Gap that in 1690 King William stayed three days in Newry while patrols scouted up around the area. One patrol was ambushed by the Jacobites in Carrickarnon with substantial losses, but King James’s army made no attempt to block the Pass. The map below was drawn by the renowned Dundalk historian H.G. Tempest in 1958, partly to settle disputes about where the Gap is. In 1600 this route continued from Flurrybridge until it reached the top of the Newry hill. It is indicated on contemporary maps but not with sufficient definitiveness to make us sure of its exact course. The old maps show two “causies” over boggy or marshy ground. We can assume that it kept as far as possible to the small rises. It is tempting to suppose that it followed the old road more or less parallel to and to the west of the modern county road. A few hundred yards south of the Carrickarnon Frontier Post this suggested road diverges (at E on map) and continues northwards until it reaches the Newry-Dromintee road at Cloghoge (F), Quite close to that point a road continues past Heath Hall and over Ballymacdermott mountain. The old maps rather suggest this route. If this is so, this road for a mile or two south of point F, must have been considerably straightened since those days. On the map accompanying this article the two ” causies ” are conjecturally marked (6 and 7). 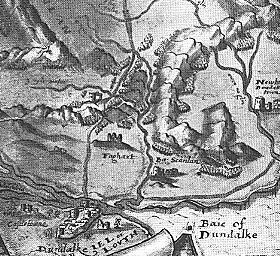 The route from B to D described above was the most difficult part of the old Moyry Pass (or Pace as it was then called) which, at the end of the sixteenth and beginning of the seventeenth centuries, was the most difficult and dangerous way from Dundalk to Newry and, as such, figures in the attempts by Lord Mountjoy, Queen Elizabeth’s last viceroy, to subdue Hugh O’Neill, ” Earl of Tyrone,” his most skilful and resourceful adversary.